Thanks for your message! How are you doing? I hope you are well! Well to be honest, I am closed on words, because I know how to express my feelings and situation here, I'm really going through some difficulties here in Senegal. For starters, my name is Blessing Yaya from Somalia, 5.5ft tall, fair in complexion, (never married before), I have 23 years of age residing in the refugee camp here in Dakar as a result of civil war was fought in my country. I am seriously looking for an honest man to show me true love and someone who can show me concerned and attention never betray me. For me, age, religion or distance does not matter, you only need a true love or friendship. About my parents, my late father Dr. Idris Mohammed Yaya was the managing director of Letshego Holdings Limited, and he was special adviser to former Head of State (late Dr AL-Azhari) before the rebels attacked our house one early morning and killed my mother and my father in cold blood. I was the only survived because he was away from home during the incident, and managed to make my way to a nearby country Senegal, where I am now as a refugee in a refugee camp. I would like to know more about you. Your likes and dislikes, your hobbies and what you are doing presently. I'll tell you more about myself in my next mail. then attached to the file are my photos before the civil war. I also like to see more of your pictures if you have any. thanks and be bless as i hear from you. I am glad to write given the opportunity now and thanks for your reply. Hope you are fine. Mine is boring here. Sorry for delaying my reply. Am from Somalia. May God protect you for me. darling please i did not see much things in your profile but i have a lot of things to tell you about me and i want to share some of my secret with you, please don,t let another person to know about all this things that am about to tell you, please keep it for yourself, i beg you in the name of God, here Its just like one staying in the prison and I hope by Gods grace I and with your help will come out here soon I don't have any relatives now whom I can go to all my relatives ran away in the middle of the war. The only person I have now is Rev. Paul timothy, who is the Reverend Minister in charge of the refugee camp. and am also a christian He has been very nice to me since I came here but I am not living with him rather I am living in the woman's hostel because the camp have two hostels one for men the other for women.The Pastors Tel number is +221775437711 through his number. If you call, tell him that you want to speak with me, and he will send for me from the hostel to come and answer your call. I want to go back to my studies because I only attended my first year before the tragic incident that lead to my being in this situation now took place. Please listen to this, I have my late father's statement of account and death certificate here with me which I will send to you latter, because when he was alive he deposited some amount of money in bank which he used my name as the next of kin,the amount in question is $5.3 (Five Million three Hundred Thousand US Dollars). So I will like you to help me transfer this money to your account and from it I can travel to meet you and live there with you. Good evening my love, how was your night together with your doing today both health and work? 54 Jermayne Street,London, SW1Y 6WL,UK. My name is ............. NATIONALITY........... AGE............... GENDER........... PHONE NUMBER............ OCCUPATION............. It is a great pleasure to write you Sir in regards to the information pass across to me by one miss Blessing whose father's name is Late Dr. Idris Mohammed Yaya the father has an account in your bank Miss Blessing Idris Mohammed Yaya in several occasion has communicated with me over E-Mail to assist her receive a funds valued at $5.3 million dollars which her late father deposited with your Bank. I do here by demand that according to advise of miss Blessing Idris Mohammed Yaya that this bank should grant our request by telling me what and how to transfer the said funds into my account in my country, I will appreciate if my request is urgently granted. I have been directed by the director of Foreign Operation/Wire Transfer to write you in respect to the E-mail which we received from you/Miss Blessing Idris) who is currently in Dakar, Senegal (Africa)Her late father (Late Dr Idris Mohammed yaya) has an account in our bank here in London with sum substantial amount of $5.3Million US Dollars which he deposit with us before his death. 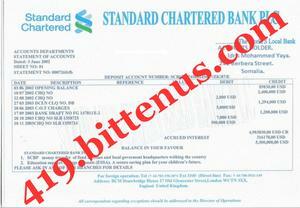 Meanwhile before our bank can transact any business of any amount concerning the transfer of this money to your designation account as her foreign partner, we will need the below documents from you immediately. 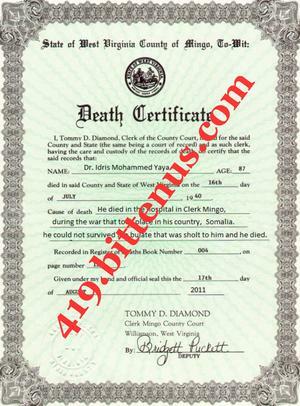 2:) The death certificate of Her deceased father confirming his death. 3:) A copy of the statement of account issued to her deceased father by our bank. 4:) An Affidavit of support from Senegalese high court where Miss Blessing Idris is residing. Note: The above documents are compulsory,and are needed to protect our interest,yours and the next of kin after the transfer has been made. These shall also ensure that a smooth,quick,risk free and successful transfer when we receive the above named documents. Should you have any question(s) please contact the Operational/transfer officer through his email address or the bank's office customer service telephone numbers. (banking hours only) We promise to give our customers the best of our services. I thank you very much for your ability to help me out,it shows you are a dependable and trust worthy person. Now, regarding the requests the bank needs from us i have with me here the last statement of account and the death certificate, I thought it will be the only thing the bank will need from us but since they need the power of attorney and the affidavit of oath from the court here in Dakar Senegal. So, i will like you to contact him for the preparation of the power of attorney Please try and contact me when you are in contact with him and let me know if he agrees to help us! Please i will like you to first of all get the money transferred and from it you can send some money for me to prepare my traveling documents to come over there in your country for the investment while i go back to my studies please! I will be waiting for you soonest. Your Ref: Attorney / affidavit of support. This Law Office has been informed by your Partner Miss Blessing Yaya about you on the legal requirements by the Bank in London to transfer her late father money to your bank account as her Appointed Trustee. TOTAL COST FOR LEGAL DOCUMENTS = ( $£572 EURO) ONLY. You are also advise to send the payment information to me soon after you make the payment to enable me cash the money here. On receipt of the above amount the legal documents will be ready within two days. THANK YOU ONCE AGAIN FOR YOUR CONTACT.